Tip for the Mate: A customary tip of 20% of the charter fee is given to the mate directly by the charter group. A deposit of $300 for Inshore trips & $400 for Offshore trips is required to reserve your date for the trip. All deposits must be received within 10 days from when you book the trip. No personal checks are accepted on the day of the trip! All fish caught by customers belong to the customers except for Giant Blue Fin Tuna. It belongs to the boat and will be sold. Customers will receive 1/3 of the final proceeds of the sale of the fish, up to the cost of the trip. This will be in the form of a credit towards another trip on the L'il Toot. The Captain will make cancellations due to the weather at the dock the day of the charter. We will try to reschedule a new date for you, but if we are unsuccessful, your deposit will be returned to you in full. Any other cancellations must be made at least 14 days before your date of sailing if we are to return your deposit. If you have an offshore trip scheduled and the offshore weather is bad, the captain will either suggest rescheduling your trip or changing it to an inshore trip. You can choose the amount of $ that you want for a gift certificate. Ex. $100 off the price of any trip ...or pay for the trip of your choice. Please contact via email Capt. John so he can personalize and create your Gift Certificate. Shirts cost $15 and are available in both colors Grey and Dark Blue, in sizes of small, medium, large, xtra large, 2X large, and 3X large. 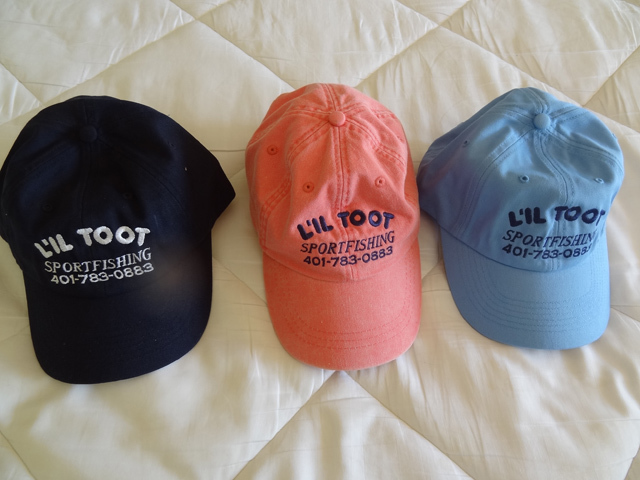 Hats cost $12 and are one size fits all in pink, light blue, and dark blue. 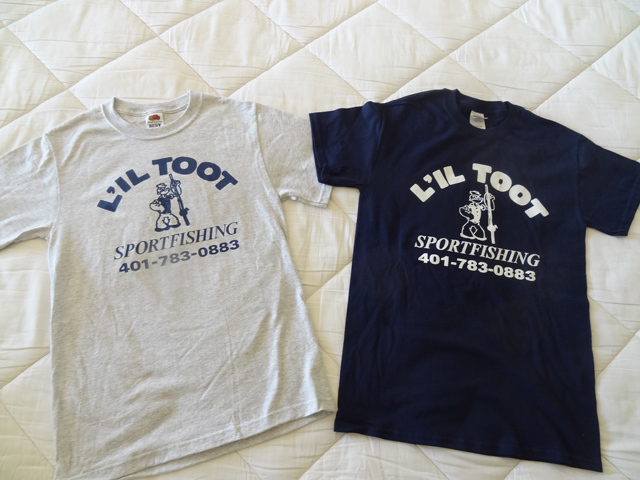 You can pay for your Shirts or Hats now and they will be ready for you to pick up on the day of your trip. If you would like them sent to you now, add $5.00 for Shipping and Handling to the total.